Tweetro App is a free Windows 8 Twitter app which enables you to view and access your Twitter account without visiting the Twitter website. 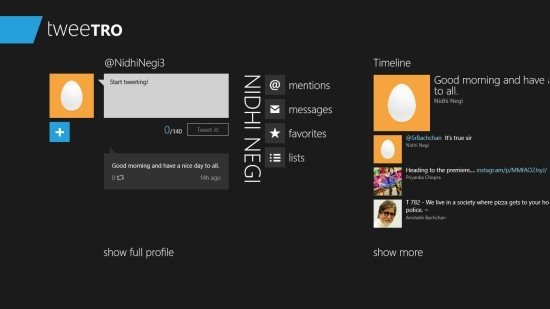 This Twitter app for Windows 8 lets you view and access everything found over Twitter such as tweets, profiles, timeline, photos, and the like. Provides all Twitter account on your desktop screen. Offers similar features as in Twitter account. Timeline: This brings you all the latest tweets posted by the people you are following. Photos: This displays the photographs uploaded by the people you are following. Add Custom Column: With a click on this “Plus Sign”, you can write and get the updates of the added website. Profile: You can view tweets, followers, following, favorites, mentions, and lists. However, one thing I was unsuccessful to find was the search bar. Like, if I want to follow a particular person then I can search for him/her, I will have to look up other people’s profile and then I can follow once I found him/her. Well, do let me know in comments if you find the same. Also, check out our post on Music Maker Jam App For Windows 8. Tweetro App is an awesome Twitter app that offers all features related to twitter on your desktop screen which shows the daily tweets, photos, and timeline. Go ahead and try this once.